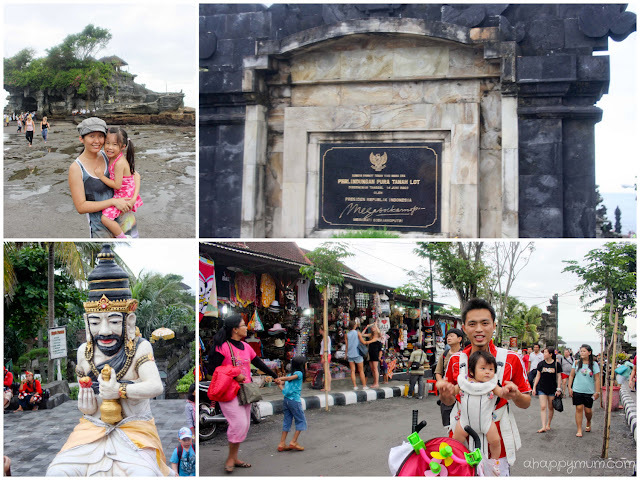 Bali was not in our list of destinations for a family vacation because in the first place, it sounded more like a place for honeymoon goers and romantic couples to enjoy spas and massages, or for the culturally rich to learn about arts, history and heritage. 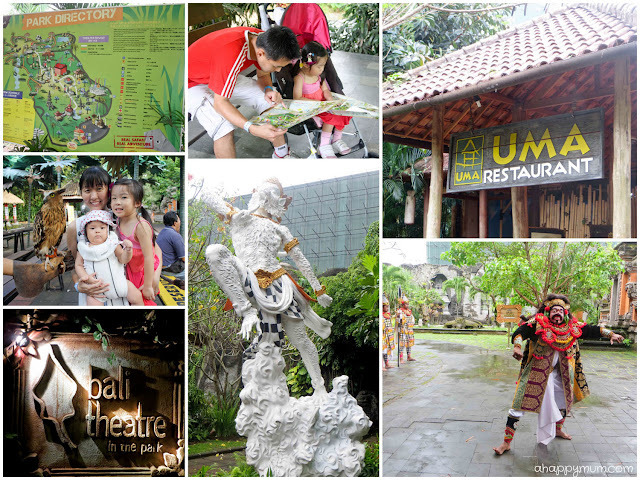 So as parents who are not really fond of visiting museums and temples, a preschooler who prefers living creatures to architecture, and a baby who doesn't really know anything except demand for milk and carry, well, Bali just didn't sound like the perfect choice for a family-friendly holiday. It wasn't until the hubby came up one day and said "Hey, I've booked a villa for us in Bali for 5D4N!" 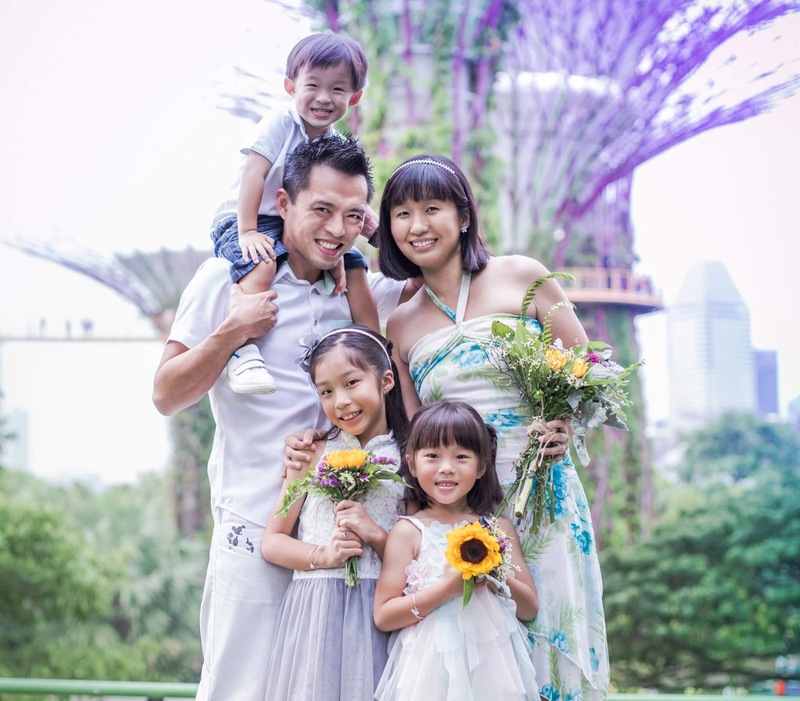 since being in the SAF allowed him to enjoy discounted rates at selected hotels. It was from that moment that we started to get all excited and looked forward to the trip. Perfect choice or not, we were resolute to work things out and make it a happy holiday. So we stayed in Furama Villas and Spas in Ubud, and boy oh boy, the moment we stepped in, we were in paradise. 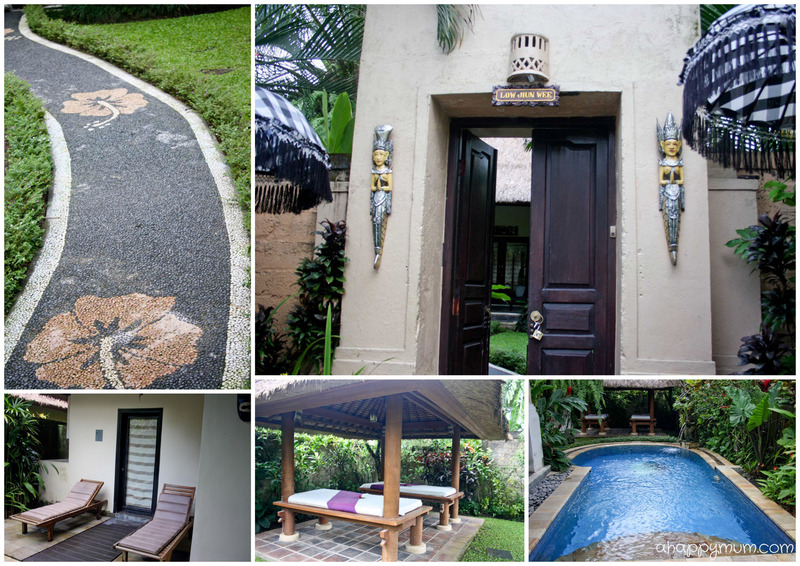 With a floor area of 265m², we had our private gazebo, patio, pool, deck chairs, outdoor shower area, huge bathroom and a dreamlike bedroom. 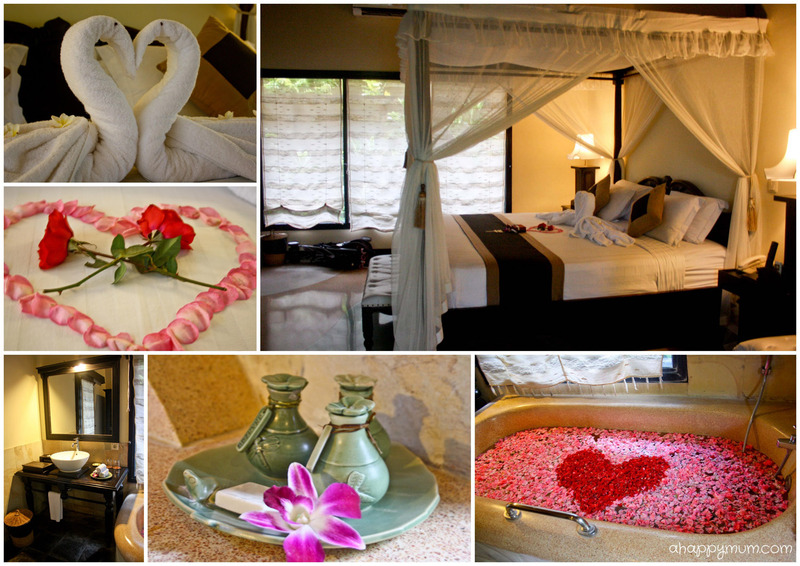 Tranquil surroundings and homely interior. What's that I feel? Well, peace. 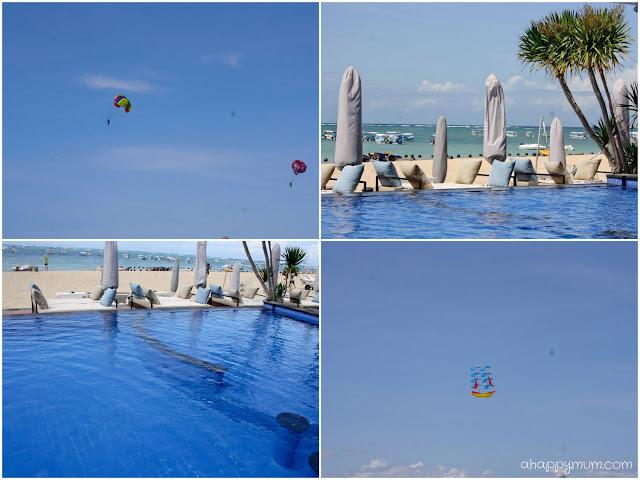 The simple yet tasteful furnishing of the place created an idyllic atmosphere and we just couldn't help it but feel welcomed, relaxed and at ease. In fact, even Angel said she wished that this was our new home and that we never needed to return to Singapore! See what a swimming pool and huge tub can do to a kid. Yum yum, what's for brekkie today? Every morning, the hubby would order breakfast in and the four of us would enjoy our first meal of the day right on our patio, clad in our jammies and sometimes even before we brushed our teeth. Oops. If there is any word to describe this, it is s-h-i-o-k.
Can you write "I ♥ U" for me? 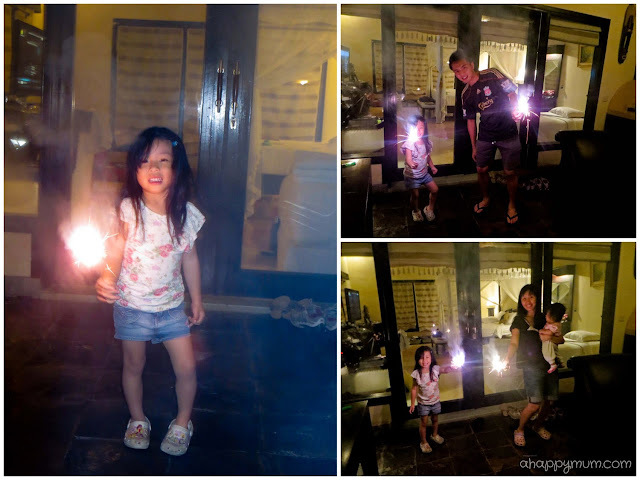 It was also an awesome idea to bring along sparklers so that Angel could light them for the first time and have lots of smokey fun right in our villa every night. Do you remember how they seemed like magic when you were a child? Well, don't ever lose that feeling. 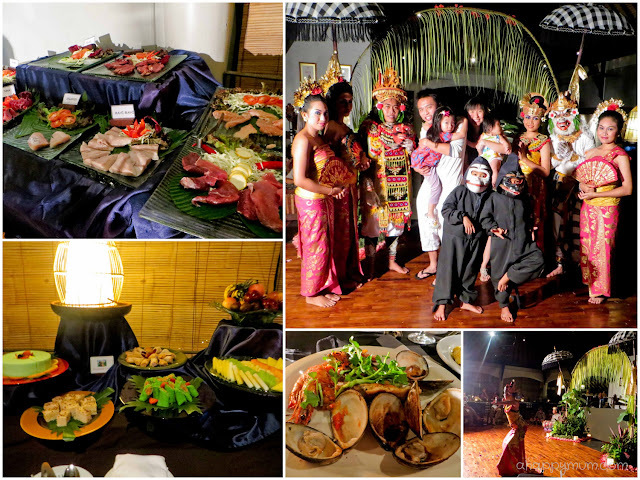 Balinese food typically has Indonesian, Chinese and Indian influences. 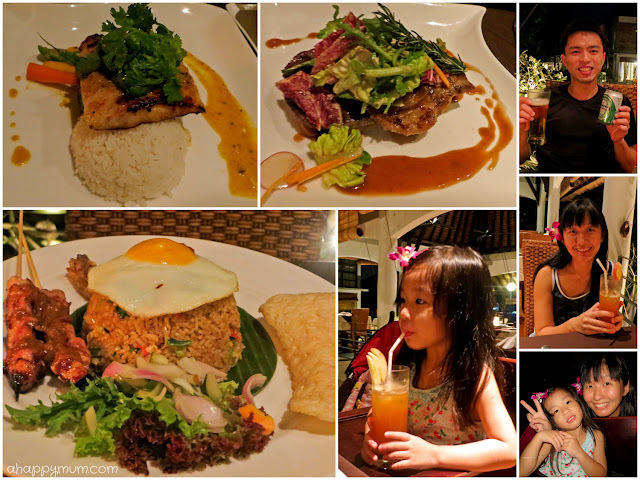 Rice is a staple food, yay for us, and if often accompanied by vegetables, meat and seafood. Dinner at Melasti Tanah Lot, a seafood restaurant on a cliff with an amazing view. We even saw fireworks! For most of our meals, we allowed our driver to bring us to wherever he thought was convenient, affordable and good. 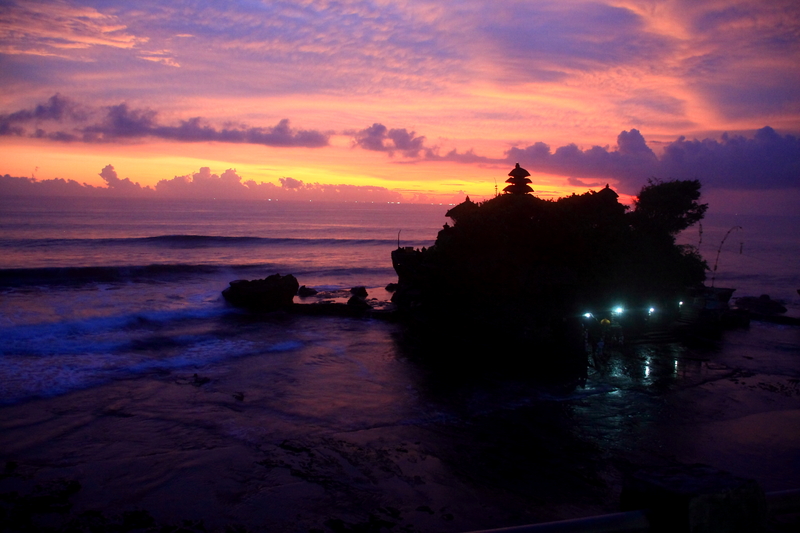 Oh by the way, you basically can't get anywhere without a driver in Bali, it cost us around S$60-70 per day to book our driver who was reliable, punctual, friendly and spoke relatively good English. 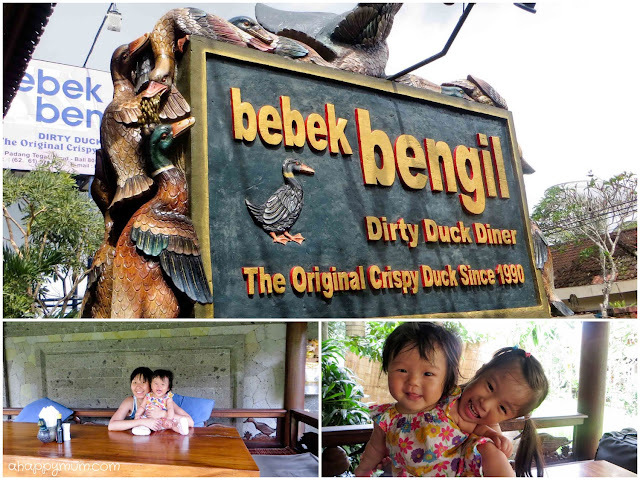 Two of the famous Balinese food that we wanted to try include Babi Guling (roasted suckling pig) and Bebek Bengil (Crispy duck). Alas, eventually we only found time to savour the latter. And I must tell you, it was FINGER-LICKING GOOD! Seriously, this had to be the best duck I had ever tasted. And yes, good or bad, I have tasted quite a lot of ducks in my life. This duck was rich in flavour, had the best aroma and it was crispy inside out, even the bones. If you ever get a chance to come to Bali, you have to visit Bebek Bengil and try this. Our first sightseeing spot was the Bali Safari and Marine Park, much to Angel's anticipation and delight. 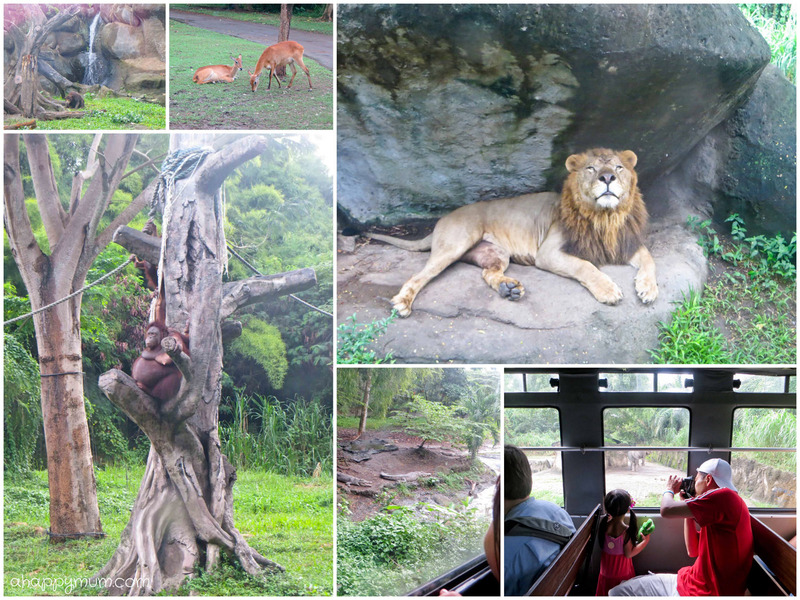 Add this to the list of zoos she has set foot in around the world, including Iceland, Zurich and Prague, and well, it's a pretty amazing list for a four-year-old. The great part about the safari journey is that you can get really close and personal with the animals, even the tigers and lions! 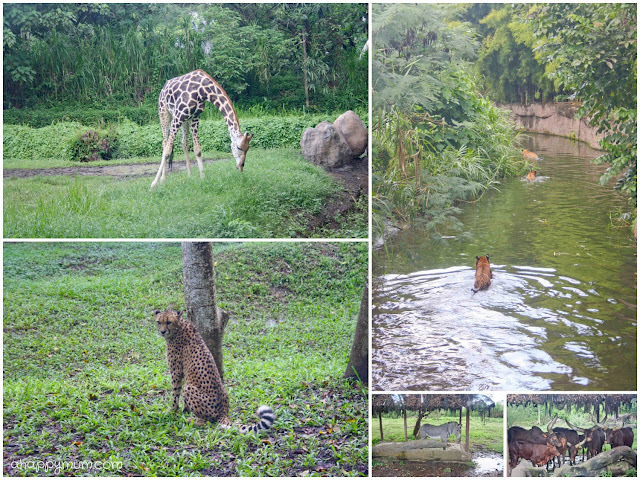 As you can see, we had quite a fruitful day at the park and were thankful that we made it here despite the morning drizzle and the over one-hour journey just to get here from where we stayed. As usual, we had no itinerary for our trip and we only decided on places to visit on the spur of the moment. 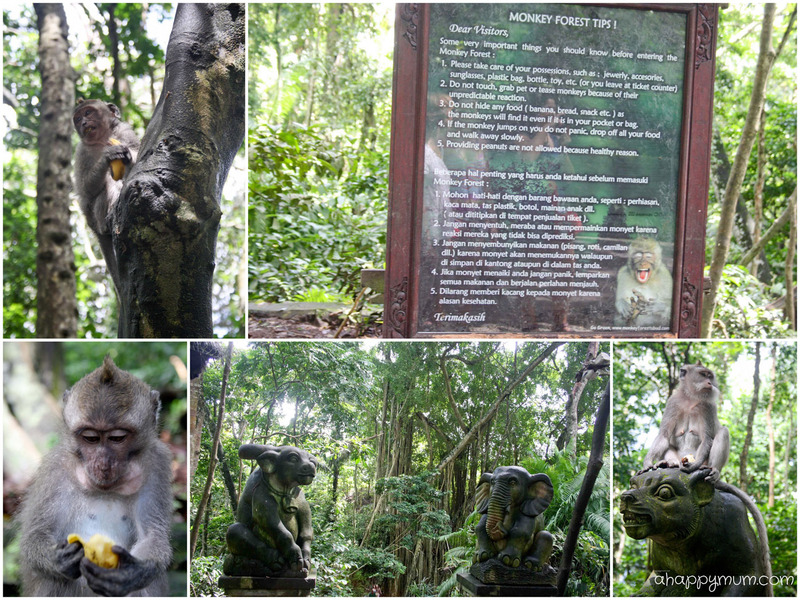 Since the Monkey Forest was near the Ubud Centre, we figured out it would be a pity to give it a miss. The monkeys within the Sacred Monkey Forest of Padangtegal are commonly called long-tailed macaques. 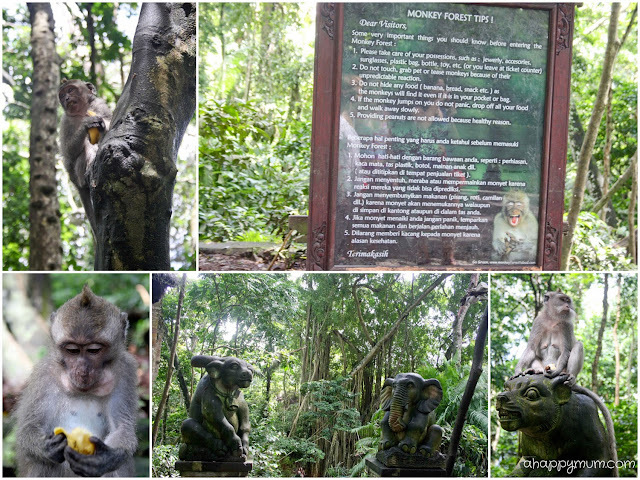 Currently, there are approximately 605 monkeys in this forest (39 adult males, 38 male sub adult, 194 adult females, 243 juvenile and 91 infants). Does that freak you out? 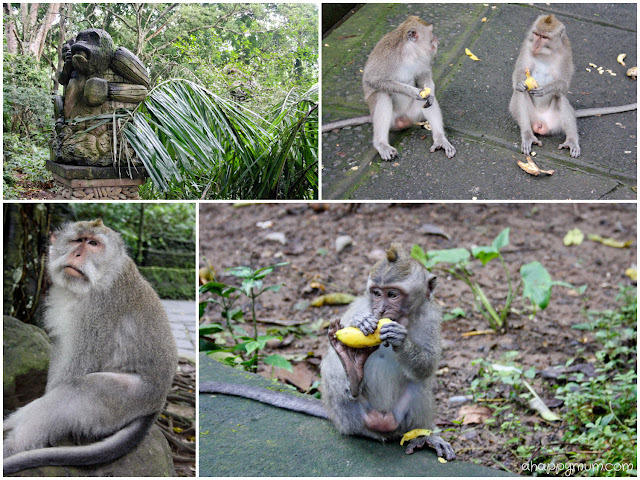 Not to worry, these monkeys are generally tame and used to visitors. As long as you don't start waving food and well, acting like its kind. So the fact that bananas were sold at the entrances meant that visitors were allowed to feed these monkeys. 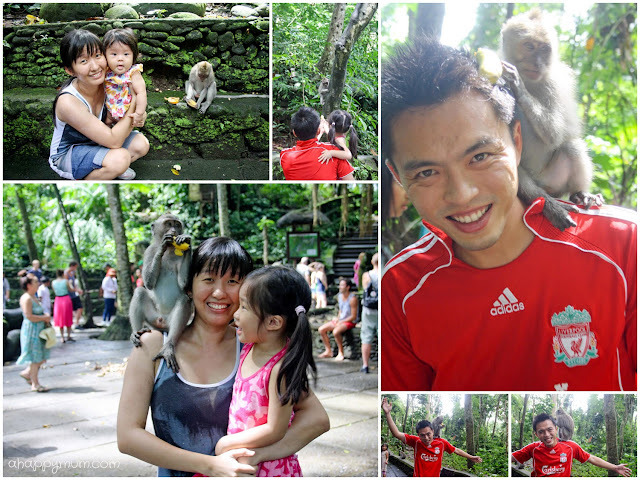 We saw some brave tourists letting monkeys jump all over them and decided, after a moment of hesitation, to take a step forward and join in the 'fun' too. 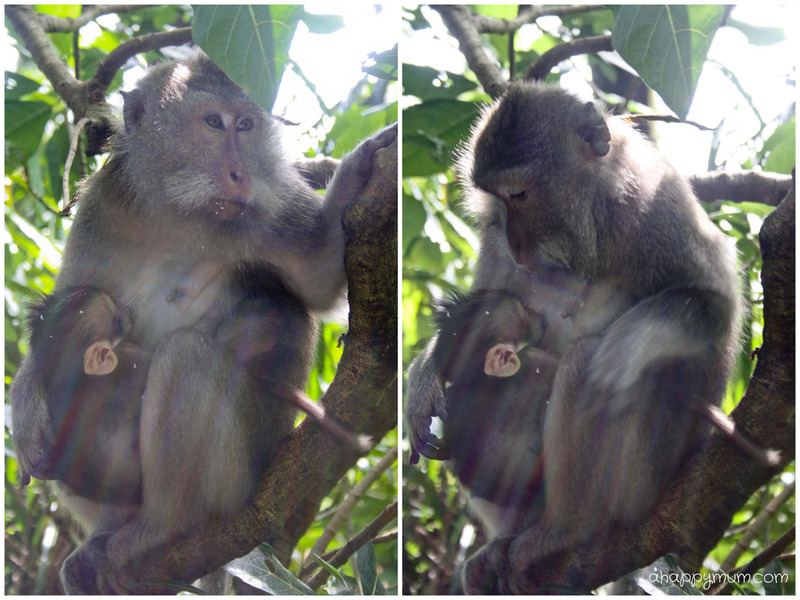 A mummy monkey breastfeeding her little one in the shade of the leaves. Sweet, right? Don't these primates remind you of us humans in more ways than one, no matter how far we have evolved? We strive to live in harmony yet compete to survive. Some of us prefer to stay in safe zones while others take a leap of faith so as to enjoy the fruits of their labour. 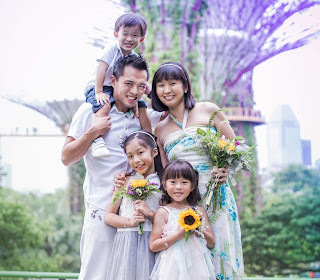 No matter how chaotic the world becomes, home is always our sanctuary and as parents, we will do anything, just anything in the world, in order to protect our offspring. 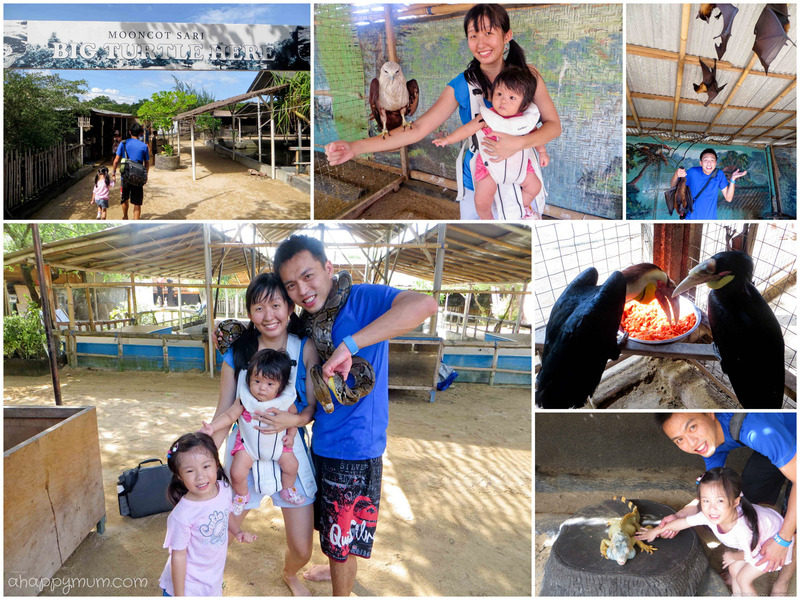 Yes, we were going to visit another place with animals! Told you my girl loves animals and we were quite willing to do it for her since we had nowhere else in mind to go. 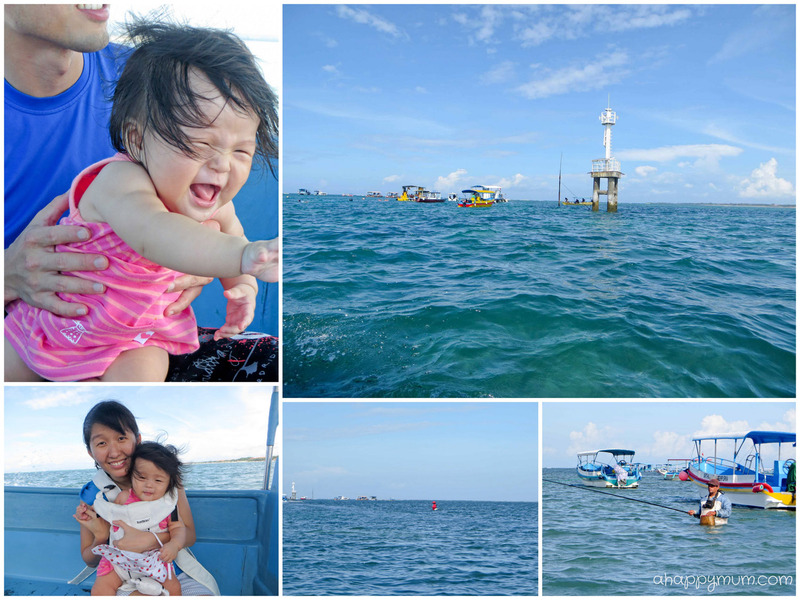 Since we were going to an island, that meant we had to take the boat and it was going to be Ariel's first boat ride! An awesome view at the beach pub where we had our lunch. Can you spot the flying ship? Soon, we reached the island, barefooted as we had to step into the shallow waters since the boat could not be parked too close to shore. 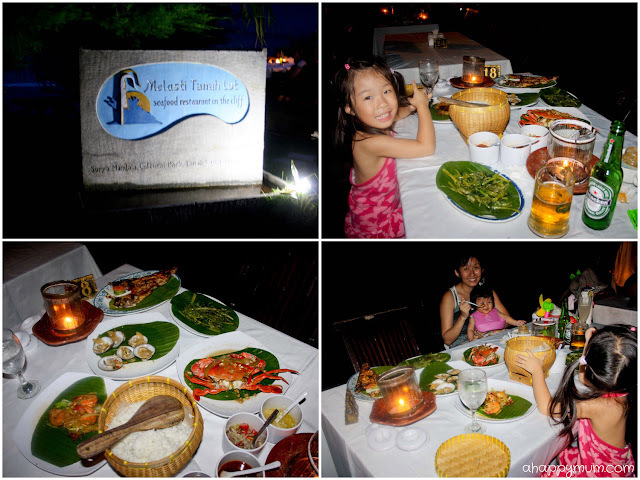 We were not sure of what to expect on Turtle island except that we would see turtles and more turtles. To our joy, we not only could feel, stroke, photograph and even carry the turtles, there were also plenty of other animals waiting for us. 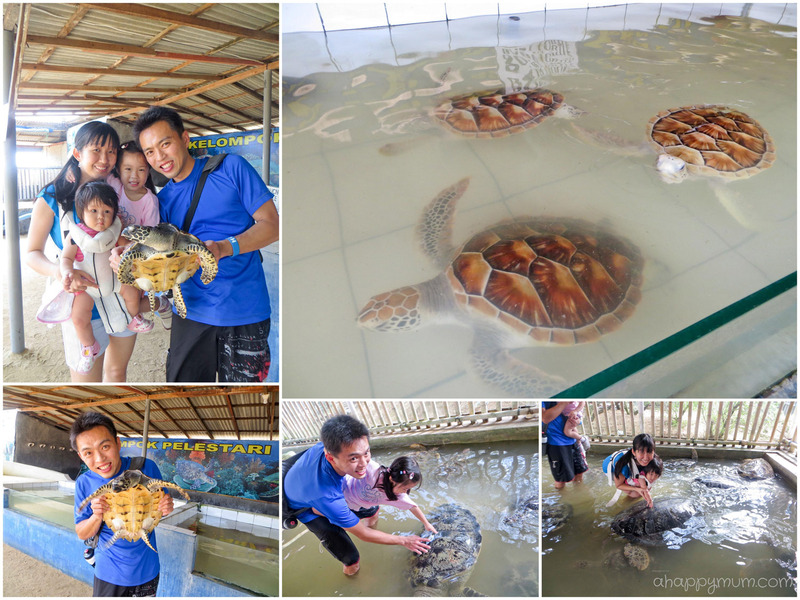 We first visited the one-year, two-year and three-year old turtles before we saw the oldest of them all - 70-year-old! The hubby's newfound pet. It wasn't easy to capture this shot and find a turtle who was willing to do it. We were told he weighed at least 25kg! 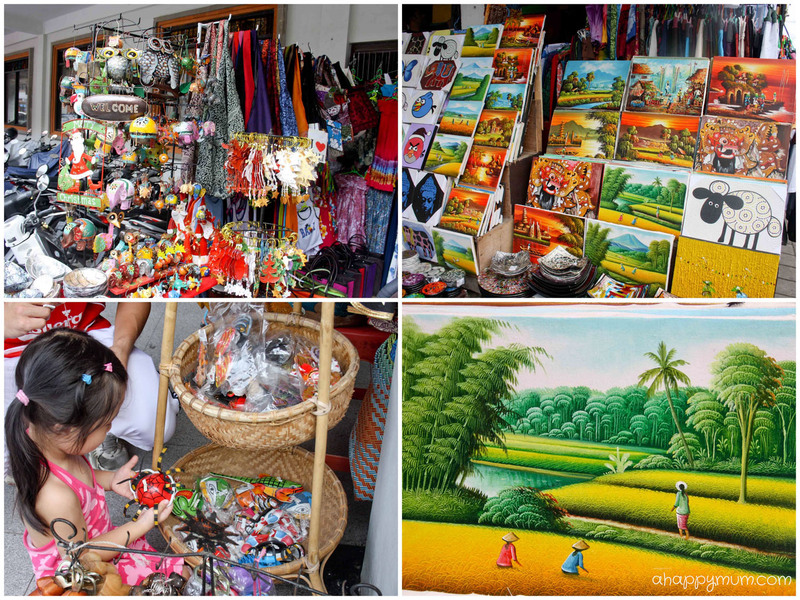 Coming up real close with an eagle, python, iguana, tucans and even bats! Except for the bats, Angel and I were willing and bold enough to pat and touch every of the other animals. Yes, leave the bats to the hubby who was amazed when the staff asked "Do you want to hold him? Here, take him by the legs." Ah huh, there's a first for everything, I guess. What else did we do that day? Nothing. Just bonding, enjoying and loving by the sea. 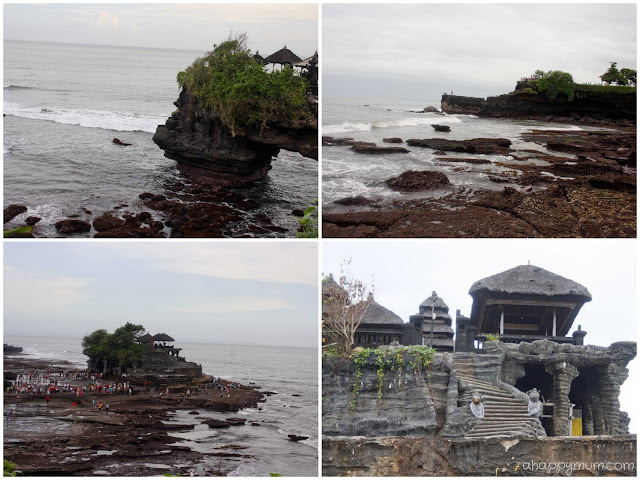 Lastly, we also took time off to check out the Ubud Centre and Tanah Lot - a rock formation and home of a pilgrimage temple, the Pura Tanah Lot, which is a popular tourist and cultural icon. 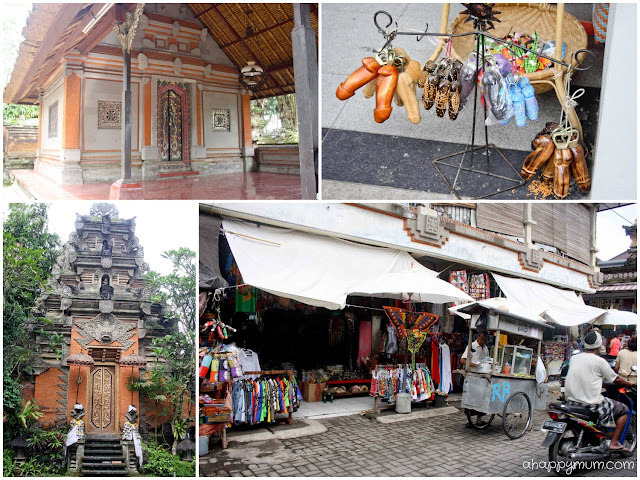 Visiting the Ubud Palace and shopping in the Ubud Centre. Do you see the phallic shape that I saw? Thanks to the hubby who agreed to wait with me for the supposedly sunset, we did have a great seafood dinner on the cliff, didn't we? So that pretty much sums up our trip. If you are considering a vacation to Bali and worried that it would be boring for the kids, well, I guess you can now think twice. Our girls loved every bit of it, from the villa to the food and sightseeing places, and we are thinking we might come back again someday. 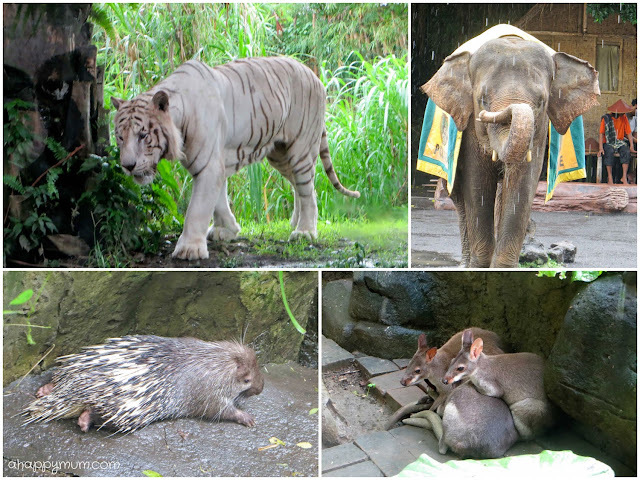 I am feeling thankful for the opportunity to see more of Asia after having been in Europe for so many years. To the hubby, thanks for taking us to the beautiful island of Bali! Till our next family vacation! Hehe thanks Klessis! 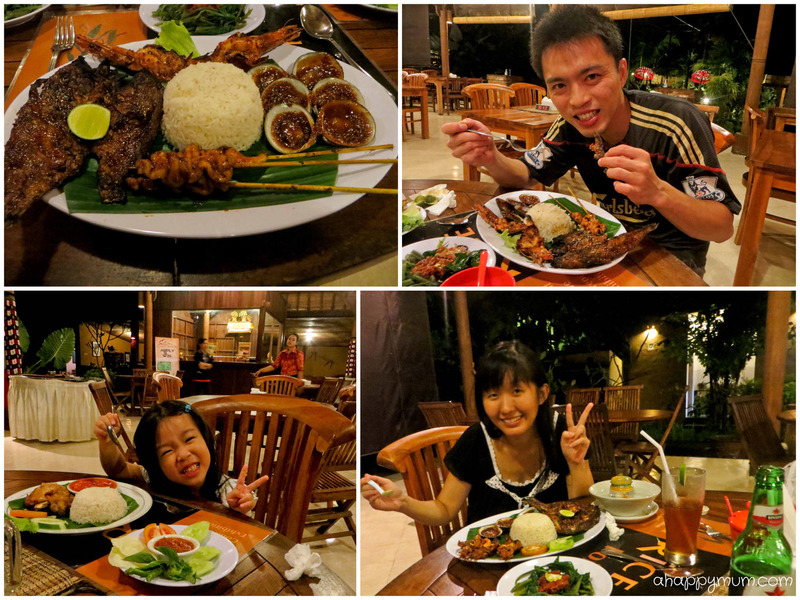 The orang utan gave me such a shock and then that trademark wide grin! =) Yes, we did have lots of fun! - oh my. That pool! - Angel sure is brave with the tiger! Looks like Ariel is following in jiejie's footsteps, patting a turtle! - Ariel's hair in the wind! Cuteness! Haha you are so funny. Oh yeah, Ariel didn't really have a choice, I held her hand to pat it! Not like she knows what is fear of creatures at this age. But yes, the jiejie sure is a very brave, me-no-scared-of-hairy-animals girl! do you still have the contact of the driver? 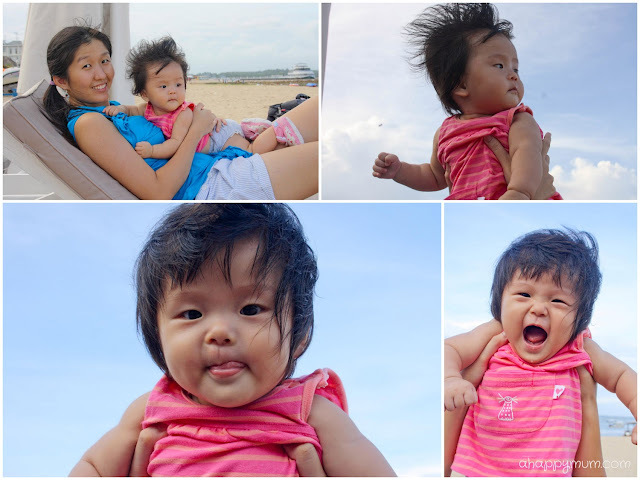 Hi Summer, May i know how old is your youngest while you bring her to Bali? 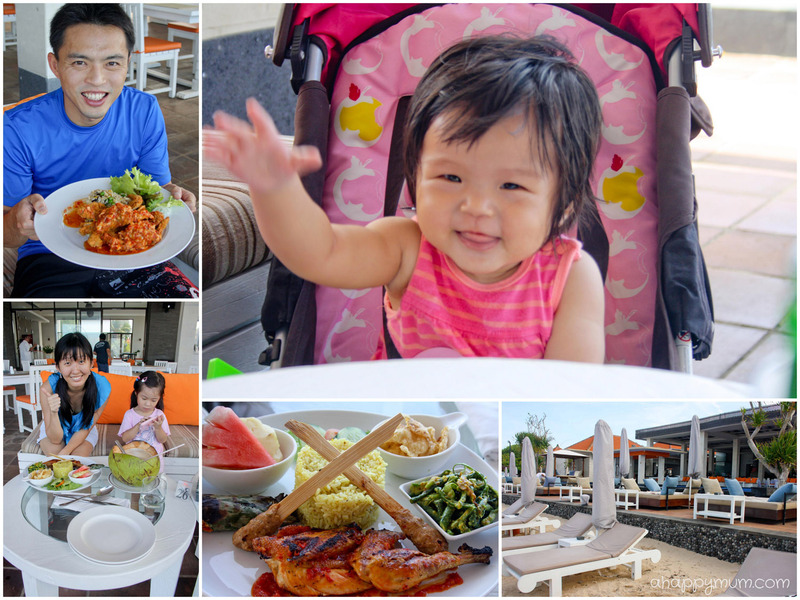 i Planing to bring my baby who 10 months old to Bali and having dolphins watching also. What do you think? cause i am 1st time bring 10 months old baby for trip. I really don't know should I bring her together. Hihi, she was less than 8 months old that time! 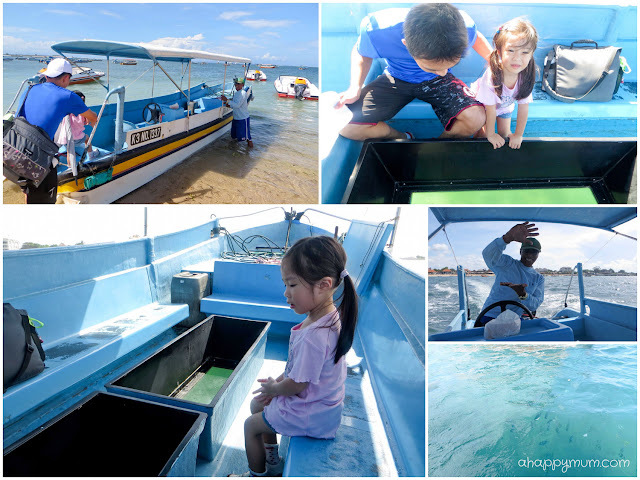 We didn't do dolphin or whale watching because of the waiting time involved and I wasn't sure if the kids would enjoy! I think your girl will do fine, just do a little bit of planning for food and activities if you can! :) also, it's best to get a driver to bring you around during your stay! enjoy!